As we age, the skin along our once firm and youthful jawline can begin to sag. Weight gain can also cause a double chin, and that is no fun, either. Chin Up is a revolutionary new non-surgical instant face lift that can slim, lift contour and firm the skin around the neck, cheeks, jaw and chin. With regular use, you can reduce your chin area by a centimeter! Using the latest scientific developments in pressure technology, this specially formulated face mask can be absorbed efficiently on the chin area; Lifting up and firming the shape of your face, promoting facial blood circulation, burning up extra fat on the face to remodel a more refined face. We're so confident of the results, There is a tape measure included in the package for you to measure your chin after each use! Chin Up contains vitamin E, which acts as an antioxidant to protect skin cells from free radicals and protects product formulation or carrier oil from lipid peroxidation. It offers improved elasticity and smoothness. Corum 9235 gives a warming sensation when applied to the skin. It stimulates the absorption of serum and promotes the losing of chin-fat. It has Q10 for strong anti-oxidant effects, giving immediate relief to dry and dehydrated skin, plus it gives anti-ageing and anti-wrinkle properties. Chin Up also fcontains an ingrediant called Skintronics, which facilitates the fat release and aids in the contouring process. The Skintronics serum converts fat into stabilized fibrous tissue and eases the edema under the cheeks, jaw and chin. It helps boost the density of collagen and cell tension, instantly lifting and firming up to 20%. 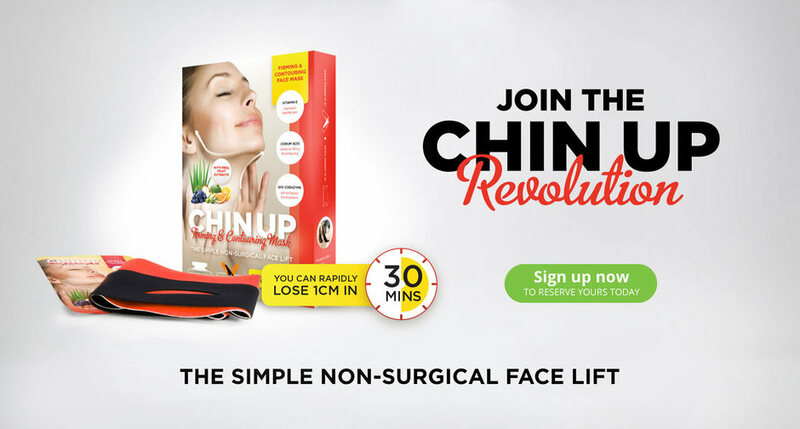 Simply apply the Chin Up mask to your face and neck, put on the Chin Up slimming band and in only 30-40 minutes you will see the remarkable effects, including a 1cm reduction of chin-fat. The effects of Chin-Up will last for several days however, it's recommended that with repeat usage you can reduce over 1cm. I received a sample of the Chin Up mask to review. It was kind of confusing for me to get my Chin Up mask onto my face correctly and I hate reading directions, so I put it on hoping I was doing it right. I inserted the moist mask into the chin area and fastened it with the velcro fasteners around my head. I immediately noticed a very warm sensation. It didn't hurt, it just felt like something was definitely taking place. I'll admit I felt like perhaps I was receiving a chemical burn, but that ended up not being the case, thankfully. 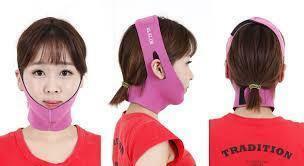 I wore my Chin Up mask while I was watching a movie late at night, hoping that no one would see me wearing this extremely odd looking contraption. I felt like I resembled Hannibal Lecter. I really didn't want to have to explain myself to anyone, but no such luck. My daughter Myelie came up the stairs and asked with a look of horror, "Mom, what on earth do you have on your face?" At least my children are used to seeing me trying out all sorts of beauty experiements, so it wasn't too much of a shock for her. I do not have a picture of myself wearing this get-up because I looked ridiculous. You can see how it looks on the model below. She rocks it! After leaving my Chin Up mask on for 40 minutes, I removed it and then massaged the excess product into my skin until it was absorbed. Wow! It really felt very moisturized and so soft and supple. I was glad I gave it a chance and did not remove the product just because I felt that I looked silly, or because it felt warm! My skin looked so much firmer along my jaw line. My skin looked radiant and renewed. This is a product that I am certain I would love if I would take the time to use it more often. ( I only used it once due to a very busy summer with not a lot of 'me time.") I will definitely give it a try when I have more time on my hands. I did not use the tape measure to see if there were any significant changes either, but again, I haven't had time to really give it a chance to work properly. Enter to win! Time is running out, but you can enter below to win a Chin Up Firming and Contouring Mask of your own by filling out the Rafflecopter form below~ Good luck!